Several years ago I stumbled across a blogger who used Tapestry of Grace. It just looked and sounded so wonderful! Classical history taught from a Biblical perspective that was designed for large families teaching more than 1 learning level. Yes, that would be me someday! Sign me up! I eagerly bought the first level and jumped in with Curly. I ordered books, made plans, and determined to do some reading myself as we worked through ancient history. By the end of the year we were simply enjoying the good picture books and not doing much else. For our next year I was ready for a new time period in history – Medieval Ages and the Renaissance! 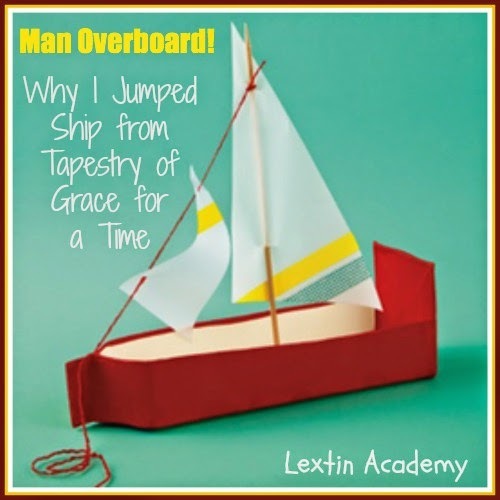 It took us two years to get through that time period and after our first year I yelled, “Man overboard!” and jumped ship. I could not keep up with Tapestry and I could not make it work for us. I wanted nothing more than to use Tapestry every year for our homeschool journey but I found that my plans changed and so did my priorities. So, why did I jump ship and take a new direction with our homeschool? Moving – During the time that I began Tapestry we had 3 moves in 2 years. All the packing, moving, unpacking, getting settled, and starting it all over again made me more than a little disorganized. It was difficult to keep up with much of our school – it was difficult just to keep up with our children. So, I had to make the choice to simplify to keep my sanity during our many moves. Cost of books – I’ve found that the library didn’t carry as many of the Tapestry books as I would like. I also found that all the ones that I wanted to use were often reserved or checked out. This meant that I would have to rearrange the order of the topics that we studied so I could have the books on hand. Therefore, I decided that buying many of the books would be very beneficial. However, this was also incredibly expensive – even if you buy used. That left me in a quandary – try to change up our week plans when the books were checked out or try to purchase the books I needed. In the end, it was too much work to hunt down the books either at the library or in the bookstore and it was very costly. Time spent planning – The “TOG fog” was very real. I read through the week plans and wanted to do everything. It was just so hard to pick and choose the topics that we would cover. I sometimes felt that I didn’t know where to begin for the week. Suddenly I found myself wanting scripted lessons and clearly laid out plans. I just wanted to “do the next thing” and not worry about missing something important or trying to organize my thoughts. By the end of the week I didn’t have the energy to read ahead in the lessons and design our TOG journey. Not being able to self-educate – One of the reasons I was so excited about Tapestry was the hope that I would be able to read a few of the upper level books as well as the teacher’s notes in order to educate myself about the historical time periods. I wanted to learn and become a better and more knowledgeable teacher as my children read the beautifully illustrated picture books for their levels. I found this did not happen for two reasons: lack of time and lack of motivation/accountability. I did not have the time to pore over the notes and resources available through Tapestry. Also, I was tired by the end of each week and did not feel like tackling the Illiad or reading Shakespeare. Since no one was holding me accountable, I quickly gave up my lofty reading goals. This left me feeling totally ill- equipped to teach history to my children. Lack of a history spine – Each week I found myself just wanting to read the “cliff notes” version with my kids to give them the overall picture. The teacher’s notes were too far above their heads to read to them and the overview was too brief. I wanted the big picture overview before we dove into the myriad of history and literature choices for the week. Tapestry did schedule Story of the World as an alternate during the grammar levels so we began using that to help us hone our focus each week. Then we found ourselves only reading the Story of the World chapters each week. Suddenly I felt that history was streamlined and simple. Planning became easy as we simply read the next chapter and I found that we made connections between people and events. A different focus – While I enjoyed history and I loved literature I found that our homeschool had a different focus. My kids are all very young. So at this point in our journey our focus was on learning to read, beginning to write, and mastering math facts. History and science were not the focal points and I couldn’t spend all of my planning time preparing for history nor could I spend all of my teaching time covering history topics. So much of my time was needed working one-on-one with my children as they mastered the basic skills. Through our homeschool journey I have discovered that I do enjoy the simplicity of textbooks, workbooks, or curriculum that comes with clear plans and directions and even scripting for the teacher. Sometimes I just needed the hand-holding to help me get through the week. While I don’t only use these types of curricula, I have found them to be helpful. Tapestry is none of these things. I simply found Tapestry difficult to use with a house of little people. I had not one independent student and I was too tired to plan, prepare, self-educate, and search for books and resources. I gravitated toward curricula that was easy to implement. I also wanted curricula that was easy to teach with little or no prior knowledge of a subject. I felt that with Tapestry, I needed to do some background reading to fully understand the topics each week and to help my children see the main themes. I felt incapable of being prepared to teach them thoroughly. So, there is the story of my Tapestry failure. However, I still love the concept behind Tapestry. I do think that we’ll go back to it in a few years. I will try Tapestry again once I have a few independent readers so that I can assign readings to them. I will try Tapestry when I can commit to having planning time to educate myself and carefully plan my weeks. I will try Tapestry paired with some type of history spine – even if they don’t line up perfectly – so that we can have some continuity in our studies. Yes, I think I will go back to Tapestry. We will probably have to ease back into our studies once my children are older. I see how wonderfully Tapestry includes discussions and Biblical worldview in the upper levels and I want that for my kids. I also want them to read the great works of literature that are scheduled. But I know that taking a temporary break was wise in order to focus on our basic skills and find the joy in simplicity rather than feel overwhelmed and rushed in our study of history.